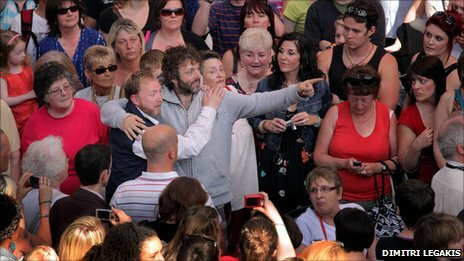 Hollywood actor Michael Sheen has had his "last supper" on Saturday as part of a 72-hour performance of The Passion. Sheen has returned home to Port Talbot to star as a Christ-like character in the marathon theatre production. He had a "last supper" of beer and sandwiches at a social club where the Manic Street Preachers performed. He will be taken to a police cell before a "crucifixion" on a roundabout on Easter Sunday. More than 1,000 local residents are also taking part in the National Theatre Wales production, which is being performed at venues across Port Talbot. The play began at 0530 BST on Good Friday with a scene on the seafront inspired by John the Baptist's baptism of Jesus, which was watched by several hundred people who had only heard about it by word of mouth. The crowd had swelled to thousands by the time the first main part of the play was performed on Aberavon beach at 1500 BST. Passion plays developed to tell the story of the trial suffering and death of Jesus Christ. Sheen, known for his portrayals of public figures including Tony Blair and David Frost, has said he was inspired by the community spirit of the passion plays he watched at Margam Park as a youngster. As well as co-directing The Passion, Sheen is also starring in the production, which has a core cast of 15 professionals from Port Talbot. However, the cast is largely made up of volunteers, including local choirs and youth theatres as well as voluntary groups. Among the performers who took part in the play's opening were girls from Neath Afan Gymnastics Club, who had to rehearse seven hours a day for four days to perfect their routine after it was changed at the last minute. Club member Rebecca Brimfield, 12, from Baglan, said: "It was really nerve-wracking but exciting. The show is amazing." Spectator Elaine Davey, 59, from Cardiff, said The Passion was a "brilliant" production. "It's a great idea to involve the whole community and to make Port Talbot special," she said. "It's good that Michael Sheen has got involved. I think it's good that people maintain their roots and give something back to the community and make the community feel proud." The production, written by poet and novelist Owen Sheers, is the last and largest of a series of National Theatre Wales "moving productions" in its first year. John McGrath, artistic director of National Theatre Wales, was pleased with the response to the play. "We've followed the sequence of events quite faithfully in making a new story based on the Passion, making it work theatrically and as a community event," he said. "We're pleased we've been able to create such a resonant contemporary story based on the Passion."